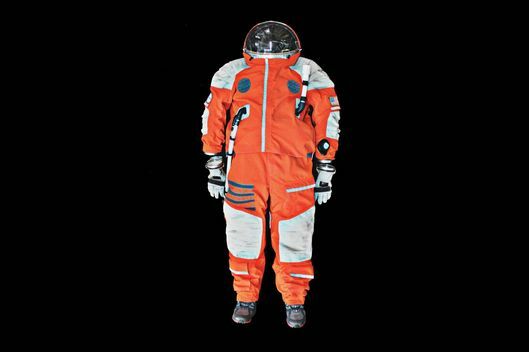 next April 8, 2015 8:00 a.m.
Space suits will largely be worn by astronauts for a long time coming, so Final Frontier Design's products will have a second life on Earth &mdash; as gear for tech-savvy, fashionable New Yorkers. 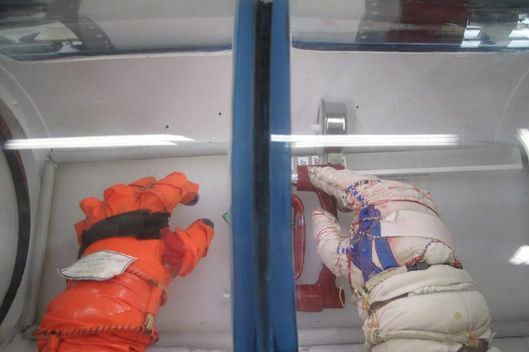 Southern, an artist and designer who began his career working on technical costumes for movies and theater, and Moiseev, who spent 20 years working for the Russian space-suit company Zvezda, got their start after winning a NASA challenge to design an astronaut glove — their model outperformed NASA’s technology. Now they describe their company as “a private design firm crafting aerospace safety garments for the future of space travel.” Since coming in second in NASA’s 2009 glove challenge (which came with $100,000 in prize money), they’ve had three contracts with NASA, worth $350,000 altogether. Brooklyn might seem strange place to be making space suits. But FFD is working at the intersection of technology and fashion and has needs that can't be fulfilled in an aerospace hub like Texas or Florida. “All the space companies are in the countryside. I have been there, and there are just no towns, nothing,” says Moiseev. “We need to be able to hire professionals from all different trades, and everyone is in New York." 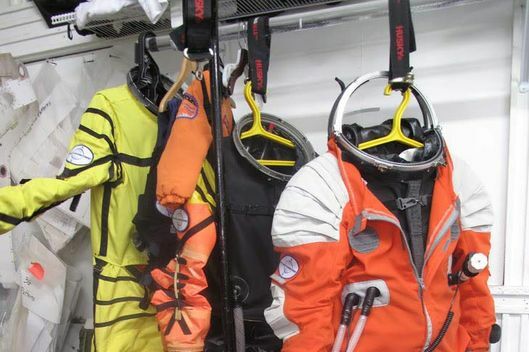 In once sense, the business proposition for a maker of space suits in 2015 is obvious: Space tourism is going to be getting off the ground in earnest in the coming years. Even after the catastrophic crash of a Virgin Galactic spacecraft last year, wealthy travelers will still likely be able to buy a ticket on a sub-orbital flight before too long. And the ultra-rich will have more and more options for buying their way into orbit. It's not a stretch to assume we are headed for a world in which intrepid tourists invest in a space suit the way they now do in scuba gear. But for a small company trying to pay the bills each month, that's not enough of a business model. So FFD has been searching for spinoff fashion and design technologies that are related to space suits but can be used right now. Later this year, the company is planning on Kickstarting a cutting-edge winter jacket that take its cues from the FFD spacesuit design. In that sense, Brooklyn is a surprisingly logical place for a space-suit company: New York has exactly the right fashion sense, tech savvy, and taste for luxury to support the creation of space gear that has a second life on Earth. When I visited their headquarters in the Brooklyn Navy Yard industrial park, Southern was busy making a wolf costume for Cirque du Soleil, adapting fabrics and techniques used in the FFD space suits. The workshop is about the same size as my two-bedroom apartment in Queens, with space suits hanging not 20 feet from a minifridge. I watched as he cut a pattern out of nylon similar to one used in the space suit’s lining and fused it together with a soldering iron for a stronger bond than sewing. It’s light, it’s nearly tear-proof, and it’s just one example of the practical application of the technologies that are discovered when making things for space. Another customer is a Spanish high-altitude balloon company that sources parts from FFD. Perhaps the coolest design FFD shared with me was for the winter jacket, made from dyneema, an “ultra-high-molecular-weight polyethylene” that is four times stronger than nylon, and aerogel felt, which Southern describes as the “world’s best insulator.” I tried on a translucent prototype sleeve, which was so light I could barely feel its presence and yet made my arm feel suddenly warm. FFD is aiming to make an entire ski outfit from this material, with gloves that feature a 3-D-printed lock at the wrist, like you’d find on a space suit, that seals so no air gets in. 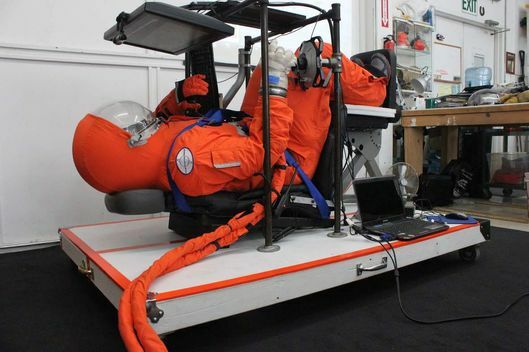 “It’s nice because it’s not space-suit material, but it’s high-tech, and uses things we come across in researching and developing new materials,” says Southern. 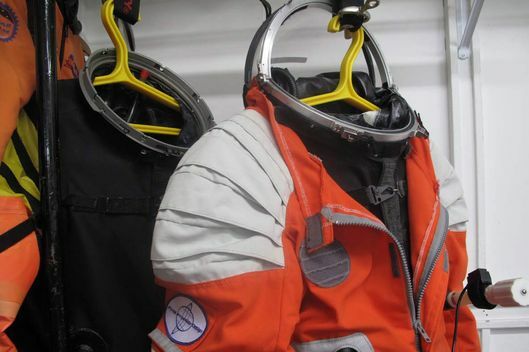 It’s not a space suit, but it wouldn’t be possible without one. They estimate a prototype jacket could cost around $1,500, but they’d like to bring it down to around $600 to sell commercially, which is more than a Uniqlo coat but less than a Canada Goose parka. This trickle-down of technology is not necessarily unique to the space age. “I have this theory that space suits and Medieval body armor are intimately related,” Southern says. It goes like this: Both are very expensive one-off garments for individuals that needed to function in challenging environments. To make the armor, workshops that were essentially government-funded developed new techniques and technologies, like plate armor and metallurgy, that pushed innovation in everything from architecture to astronomy. Those innovations, Southern believes, helped set the stage for the Renaissance. Southern's not claiming to be single-handedly altering the course of cultural history, but like armor, space suits push human capabilities, he says. And space technology's usefulness has never been limited to space. Aside from keeping astronauts alive, one of space technology's greatest coups is making life better for everyone stuck firmly on Earth — including those of us who are just looking to stay a little warmer during a cold Brooklyn winter.